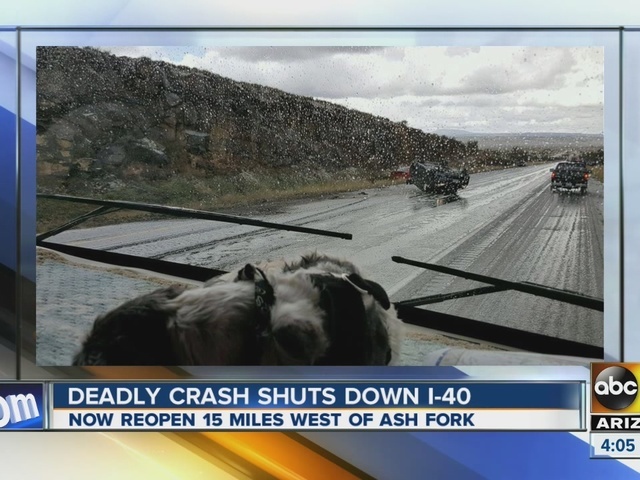 A weather-related crash killed two people and hurt six more along Interstate 40 just west of Ash Fork on Saturday. According to the Arizona Department of Public Safety, a series of crashes began along I-40 around 9:45 a.m. when a vehicle rolled over in the westbound lanes due to hail and ice on the roadway. Two people who stopped to help the victims of that crash were hit by a commercial vehicle and died instantly, according to a release. Those two crashes caused a chain reaction of at least three additional crashes that injured six people. All were taken to Flagstaff Medical Center with non-life threatening injuries. The freeway remained closed as of 2:30 p.m. while troopers continued their investigation. Traffic is being detoured onto Crookton Hill Road, a diversion that ended just after 7 p.m. when all lanes reopened.